What I love about oriental scents is that they make you feel exotic and propel you to far away places (or what you imagine far away places are like). 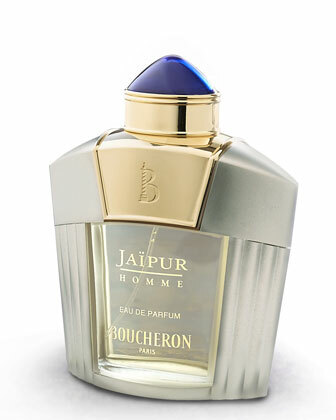 A continued standby for the past few years for me has been Jaipur Homme by Boucheron. This is a spicy scent… the cinnamon, clove and nutmeg really pop. There is no dry down, there is no change as the day goes on. It is a one level scent that so beautifully feels exotic. It’s light enough in the summer to wear; mixed with a little perspiration and you feel like your walking through the streets of India. But it’s also perfect as a winter scent, the spices comes alive and adds color to any gray, cold and damp day. Whenever I wear this, I feel elegant. This is not a young man’s cologne, and it is most suited for evening wear unless you work in a law office. Jaipur has wonderful sillage and is incredibly long lasting. This is a scent for the sophisticated man…the exotic man. Categories: Boucheron | Tags: 4 bones, Boucheron, cinnamon, clove, EDP, exotic, Jaipur, masculine, nutmeg, oriental, parfum, review | Permalink.